I am glad that it matches the equipment of various manufacturers (same installation hole). This review is about item#46529892. Replacing the switch, the function recovered the same as when I bought it. Because it is a thing only used once a year, I did something new instead of replacing it. This review is about item#46527984. Whether the micro switch of the open deck was defective or the capacitor went out ... Since the motor did not turn or started moving, I first thought of the switch, but at that time it became V-1A44 Since the model number is not a waste variety, since it is similar in size, I purchased this, now I am working with a cutlet. Was good. Performance is obviously Omron. This review is about item#39098613. Since the switch used for 10 years did not function, I replaced the switch with the same condition. I am happy that we could exchange even an amateur without a professional necessity. This review is about item#39098656. This type of switch is various, but what I was looking for was weak force to join contacts, but since that force was displayed numerically on the pressurizing behavior of each item, it was very helpful It was Thanks to your inquiries, it was completed in one shot, the repair was completed, and it was in time for agriculture. Originally made overseas was attached Domestic manufacturer with the same size and peace of mind I appreciate it. This review is about item#39098875. This review is about item#39098936. I bought a Chinese foot switch 10A but this switch is completely defective and once you use it, even if you let go of the switch it will leave the switch. After all it was no good made in china. 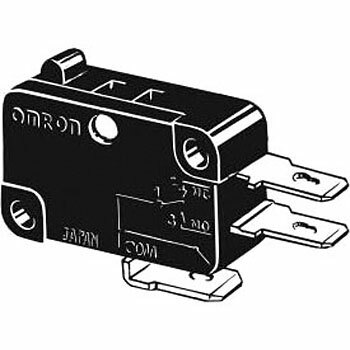 I bought Omron microswitch with Monotaro and tried to exchange it. After exchange it is usable without any problems. Thank you very much. This review is about item#39098893. It is compact, easy to use, and there are no breakdowns so we are using it with confidence. This review is about item#39099164.